One player is the Storyteller, and creates a story using the ingredients on their cards. They try to guide the plot towards their own ending. The other players try to use cards to interrupt them and become the new Storyteller. The winner is the first player to play out all their cards and end with her Happy Ever After card. 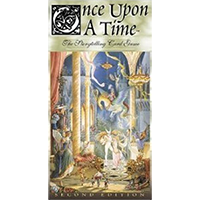 This second edition features a full-colour format, beautiful new art, an extended card set, high-quality linen-finish cards, and blank cards to script your own endings.